Easy RSS the Renewable Software Specialists have confirmed today the launch of their new Renewable Software Suite. The new software suite gives Renewable Installers access to a range of expert design tools covering the major renewable technologies. 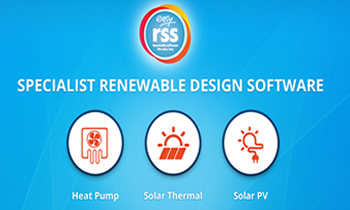 Easy RSS have launched a suite of “cloud-based” renewable design software covering 3 of largest renewable technologies; Solar PV, Solar Thermal & Heat Pumps. This software has been developed specifically for the MCS Installer and is designed to provide an all in one system to produce design calculations compliant with the latest MCS & MIS standards. Speaking at the launch, Operations Manager for Easy RSS, Simon Roberts said "we are thrilled to be able to announce today that the Easy RSS Renewable Software Suite has now launched. Installers who have been on the waiting list, eagerly awaiting to access the suite, will now be able to do so. The suite incorporates all the key design and calculation tools an installer could require and focuses on a basic philosophy of, easy to use, expert software providing compliant, accurate results. Over the coming months the software will be further expanded to include a Free downloadable app and expansions in the functionality offered. A fantastic offer is in place for active customers of our sister brand, Easy MCS, who will all be able to access the software Free of charge, alongside their support programme. For none Easy MCS customers a 7 day Free Trial is available to get a taster before joining the programme". With the UK’s No.1 MCS Certification Support specialists, Easy MCS, backing the software, and with all active Easy MCS customers getting FREE access, this new range offers a whole suite of functions designed to make an installers time on site or in the office, easier and quicker. This new expert range of specialist software allows the Installer to complete the full project calculations from start to finish with smart project storage facilities built in. For Air and Ground Source Heat Pump sizing, full room by room heat loss calculations can now be completed effectively and efficiently. The software includes full project management functions including the ability to take on site photographs and complete the full project design calculations, in PDF form for the customer. Full project management, allows the creation, storage and revision of all an Installers Heat Pump projects throughout the year, giving the Installer safe, easy access whenever they require. The Heat Pump sizing software has designed according to the EN 12831 Room by Room calculation method and in conjunction with the Heat Emitter guide for domestic Heat Pumps. In addition to completing on site calculations utilising U-Values, On Site photographs, Room by Room Sizing, Emitter Options and Specific Weather and Irradiance Data. This specialist design software includes accurate Temperature Star ratings and Emitter sizing for each and every project. Those looking to carry out Solar Thermal Installations can now produce MIS 3001 calculations utilising the very latest in Solar Thermal Energy performance calculations. This will give Installers on site ability to calculate the Renewable Heat Incentive estimates, Modified Solar to load Ratios and potential savings on energy bills. All this is completed in a cloud based environment. The Easy RSS image upload function allows you to upload images collected during the site inspection or of the final completed installation. These can be stored in your project folder for you to review at any time. Alongside this, the comprehensive System Results function gives you instant access to System Data along with Financial & Environmental benefits based on the information specific to the project. Alongside the Specialist Heat Pump Software, the Easy RSS Solar PV Calculation Tool further reduces your calculation and design time on all your Solar PV Installations. Design times can be reduced to a matter of minutes with the output being an MCS Compliant calculation for your customers. One of the flagship features of the Solar PV design software is the Easy RSS Horizon Chart. Simply upload the image taken from the customer’s property and you can quickly and easily apply full shade circle and shade segments with a few simple clicks. With each Easy RSS software package customers will also receive the award winning MCS Certification Support which includes access to a personal MCS Mentor throughout the year. Alongside this, they will receive a bespoke Easy MCS Quality Management System which includes a cloud based and hard copy version along with an interactive record keeping function and support through any audits and spot checks. Once you register for your Easy RSS Software you will be assigned a designated mentor who will be on hand to assist you in getting to know your QMS, support on recent changes and updates, adopting these processes into your business and training you on your new Easy RSS design suite. To access the software, simply speak to your Easy MCS Mentor on Freephone 0800 882 43 12 or visit http://www.easy-rss.co.uk to find out more and start your 7 day Free Trial. If you are an Easy Green Deal customer and interested in diversifying into Renewables then please Freephone 0800 612 43 42 to speak to a member of the advice team.